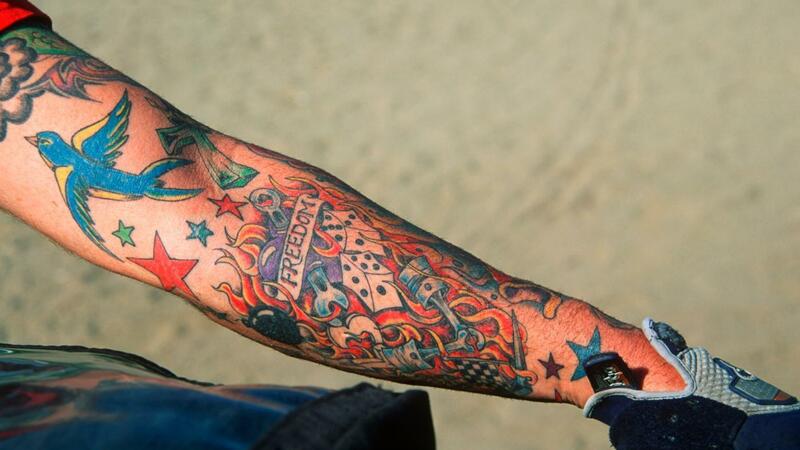 What Are the Colors of Tattoo Ink? Tattoo inks, also referred to as pigments, are usually made from minerals and vegetable dyes. Black, red, brown, orange and yellow pigments contain a mixture of minerals and organic ingredients. Black pigment comes from magnetite crystals and jet powder. The color for black pigment can be created from soot that is produced by carbon that has undergone combustion. This pigment is also made organically from logwood extract that is found in the heartwood of the Campeche tree that grows in Central America and the West Indies. Black pigment has iron oxide like other pigments such as brown and red. Brown is made from ochre, which is a mixture of iron oxide with clay. Brown pigment derives its color from yellow raw ochre that dehydrates into a reddish color. The iron oxide in red pigment gives it the color of rust. Other red pigments are made from the minerals cinnabar and cadmium. Some yellow pigments come from ochres, but some come from plants as well. Turmeric, a type of root from the ginger family, is used for yellow pigments. Yellow pigments can also be made from cadmium. Orange pigment contains organic and inorganic compounds such as disazodiarylide, disazopyrazolone and cadmium seleno sulfide. How Do You Make Homemade Ink? How Is Tattoo Lettering Used? What Are Some Tattoo Designs With Names? What Is the Name of the Tattoo Shop in the Show "Miami Ink"? What Is Indian Tattoo Ink Made From?